DALLAS -- Diplomas from outstanding medical schools. Records free of discipline. A team trusted by a president. For all the strengths of Texas Health Presbyterian Hospital Dallas, the first U.S.-diagnosed Ebola patient walked through its seemingly weakest link: the emergency room. Presbyterian met or exceeded 75 percent of 138 specific measures of care, according to its most recent data. But its emergency department failed to meet all five national patient safety and quality benchmarks the hospital reported. Those measure how long it takes for patients to be seen, admitted, or otherwise cared for in the ER. "When wait times get longer, it creates an environment where people are more likely to make mistakes," said Dr. Ashish Jha, a Harvard University professor and director of the Harvard Global Health Institute. "It's a recipe for things not going well." The hospital itself says emergency wait times may indicate understaffing or overcrowding that "can result in treatment delays and more stress for patients." Thomas Eric Duncan first entered Presbyterian's ER on Sept. 25, complaining of abdominal pain, severe headache, dizziness and nausea. He was discharged after a few hours, but returned two days later and eventually died of Ebola. Two of his nurses became infected. For the year ending March 31, patients in Presbyterian's emergency department waited 44 minutes on average before their first contact with a health care professional, 50 percent longer than state and national waits. They spent more than five hours in the emergency department, on average, before being admitted, more than an hour longer than state and national averages. Presbyterian reported meeting one of six emergency department benchmarks in 2012-13. Hospital spokesman Wendell Watson said, "Wait time is only one component of patient care and patient experience." Others insist longer wait times can reflect a workflow problem, with lags for X-rays, tests or admissions. "To miss your benchmarks in emergency room waiting times is probably the greatest indication that your ER is not up to snuff," said Jamie Court, president of the nonprofit Consumer Watchdog. In other areas where Presbyterian reported data and for which federal benchmarks exist, the hospital largely met or exceeded national averages. Presbyterian -- where former President George W. Bush underwent a heart procedure last year -- exceeded seven national benchmarks for strokes, earned perfect scores on a number of surgical measures and met six of 10 criteria on heart attacks, according to its data. It had nearly no infections from IV insertions, about 75 percent fewer than national benchmarks. Those infections had been a problem for Presbyterian in 2011, when increasing cases prompted a hospital task force. This summer, a Presbyterian infection prevention specialist published a study describing how the hospital dramatically decreased infections by strictly enforcing rules about how long to scrub the hubs of catheters before inserting them. Health safety consultant Michael Millenson, a visiting scholar at Northwestern University, says it's laudable that Presbyterian addressed the problem, but added that federal standards are weak and it took years to do what should have taken weeks. 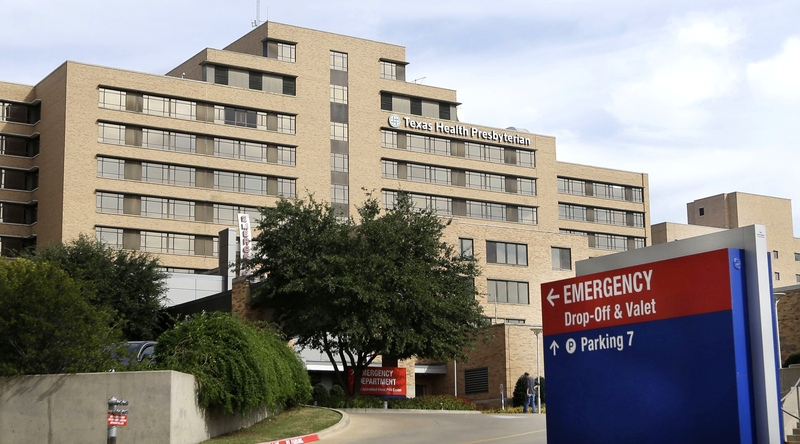 Texas Health Resources began posting detailed data online - from heart attack mortality rates to post-surgical infections - for each of its 17 hospitals this summer. U.S. hospitals are required to send such indicators to the U.S. Centers for Medicare & Medicaid Services, but do not generally post them on their websites. "We've committed to show it all, both the good and the bad," said now-retired Texas Health CEO Douglas Hawthorne. When Duncan initially appeared in Presbyterian's ER, several potential warning signs apparently went unnoticed. "He had symptoms that could be Ebola but could be any number of things when he showed up at his first visit," said Dr. Greg Moran, an emergency and infectious disease specialist at UCLA who reviewed Duncan's medical records. "The miss was basically a simple question that the physician didn't ask: Had he traveled? I don't see documentation that the physician asked that question." Duncan had recently arrived from West Africa, where the largest outbreak of Ebola ever recorded is occurring. But the only reference to Africa came in a brief nurse's note. Two medical specialists reviewed hospital records detailing Duncan's ER treatment for The Associated Press, which received the documents from his family. They noted that Duncan had somewhat abnormal blood and urine test results that could have raised questions, particularly about his kidney function. Along with a fever that spiked at 103, that might have indicated an infection, mild dehydration, the onset of diabetes, or nothing at all, they said. But combined with Duncan's travel information, the results would have prompted them to consider the possibility of Ebola, they said. Instead, Duncan was sent home after four hours with a prescription for antibiotics and a handout about sinus infections. Four hours later, a specialist reviewed his CT scan and ruled out a sinus infection. The records don't indicate that information was passed on. Jha, who also serves on a federal commission studying ER mistakes, said 5 percent of all emergency room visits are misdiagnosed - "a very high error rate." At Presbyterian, ER doctors don't actually work for the hospital. Texas, like some other states, bars most hospitals from employing physicians directly, said Allison Winnike, a University of Houston health law professor. "The idea is to keep the physicians independent from the hospital so they could act on what's best for the patient and not what's best for the hospital," said Dr. William Durkin, a former president of the American Academy of Emergency Medicine. Presbyterian's ER doctors are private contractors who work with Texas Medicine Resources LLP, which has had the contract to provide them for 38 years, according to Dr. Ralph Baine, the president of Emergency Medicine Consultants, a related company that handles many administrative functions for the doctors. Those two companies operate out of the same Fort Worth office. Supplies, support staff and other emergency department needs are provided directly by Presbyterian. The setup has no impact on care, Baine said, adding, "Our physicians are held to the same standard of care regardless of the legal structure under which they operate." But Daniel Zingale, who pioneered California health reform plans, said having non-staff physicians creates a certain amount of risk. Even under ordinary circumstances, he said, it's a challenge to maintain coordination and flow of information in a system divided between health plans, hospitals and providers. "In a public health emergency, there are clear advantages to a more integrated and seamless system," he said. Consumer Watchdog says having physicians working in independent groups rather than directly for the hospital can lead to weaker care. "If you have doctors who are not salaried and on staff, you're less likely to hit public health benchmarks as you are about the business goals of that contract," said Court, the group's president. The AP has attempted to contact dozens of individuals directly involved in Duncan's care. None has been willing to speak. Messages left for the ER doctor who first treated and released Duncan, as well as his attorney, have gone unanswered. Texas Medical Board records show that none of Duncan's 20 doctors have ever been disciplined, investigated by the board for malpractice, had restrictions placed on their licenses or been linked to any criminal history. Dallas County court records show relatively few malpractice cases filed against them. Some earned medical degrees from schools including Harvard and New York University. On average, they have about 14 years of experience. Among 32 nurses involved in Duncan's care whose records could be located, none had a disciplinary record. They averaged about six years of experience in Texas. Presbyterian has conceded its Ebola training was not fully deployed, and apologized for Duncan's initial misdiagnosis. A public-relations push has included posting videos of nurses praising the facility and a "PresbyProud" Twitter campaign. Watson says Presbyterian wants to move forward: "We are determined to be an agent for change across the U.S. health care system by helping our peers benefit from our experience." But the mistakes are baffling, said Dr. William Schaffner, an infectious-disease specialist at Vanderbilt University Medical Center in Tennessee. "I would have thought that literally every hospital would have said, 'Hmmm, one of those patients could walk into my emergency room and so we had better start reviewing our infection control program, make sure it includes these Ebola-specific issues, make sure we have the personal protective equipment and make sure that our staff is prepared,'" he said.